One man and his balloon. Field leader Prof. J. P. Steffensen (Centre for Ice and Climate, University of Copenhagen) in front of one of the balloons used in camp. Credit: S. Kipfstuhl. A curious experiment is taking place in Greenland. 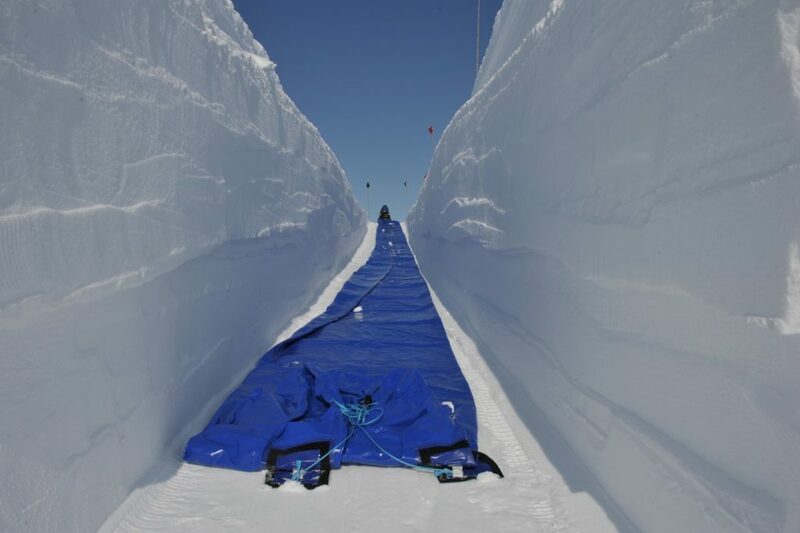 An experiment involving very large balloons and – of course – a lot of snow. 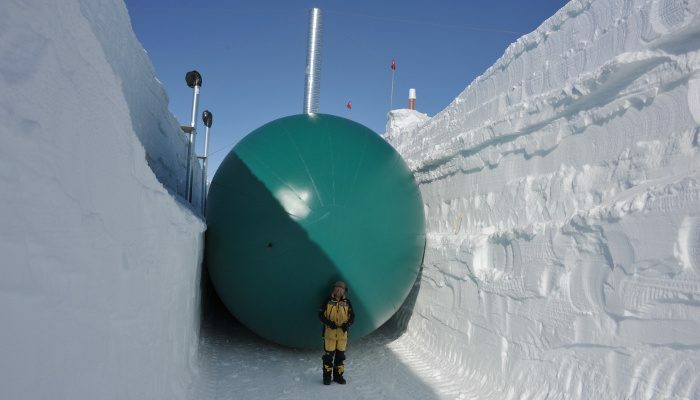 Read on to discover why balloons are an environmentally friendly tool when constructing an ice core drill camp. 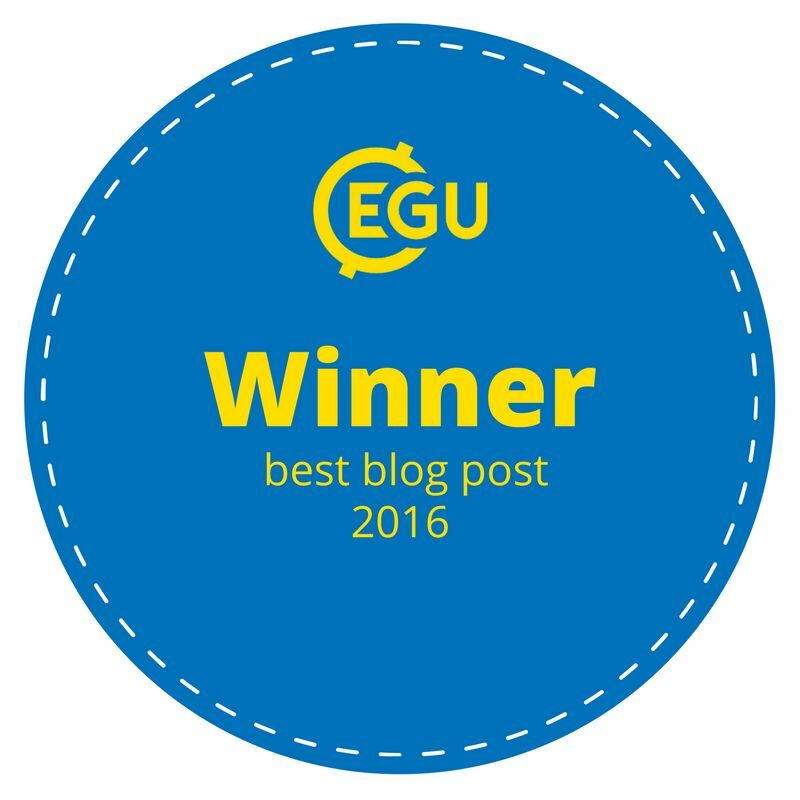 Last year, a small team traversed 400km from northwest Greenland to the EastGRIP site (read more about the traverse here). This year another strenuous task is waiting: setting up the camp and getting everything ready to drill through the largest ice stream in Greenland: The North East Greenland Ice Stream. What about the balloons then? 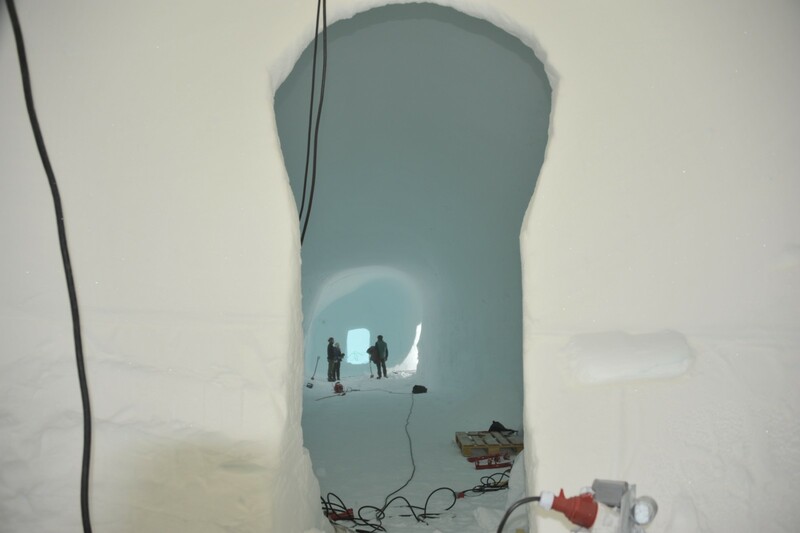 When drilling an ice core it is convenient to set up the drill in a place that is sheltered, so that the drilling operation is not hampered by bad weather. It is also best if the ice core is handled in areas where the temperature is not too high. The obvious solution is to dig out caves under the surface of the ice sheet. They provide both a shelter for the weather and a natural cold room. At previous camps, the underground caves or “trenches” have been constructed with wooden beams as a ceiling. However, after several years of snowfall the beams will start to collapse under the weight of the newly accumulated snow. This year, scientists at the EastGRIP project are attempting a different and completely new approach. Relying on the fact that a dome-shaped ceiling is a very stable construction, the trenches are built using very large balloons. The construction process is quite simple although like all polar fieldwork it also requires hard work. Pictures by S. Kipfstuhl combined to show the construction of the balloon trenches. First, trenches are dug out of the snow with snowblowers. The balloons are then laid out in the trenches and inflated. Once they are fully inflated they are covered in snow and the snow is left to settle for a couple of days. The balloons are then deflated and beautiful caves appear. 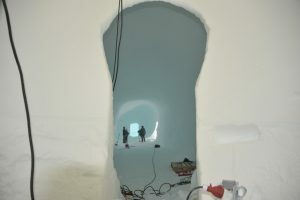 After a bit of tidying up, the caves can be outfitted with drills, equipment and other necessities. A look into the beautiful caves left behind when the balloons were deflated. Credit: S. Kipfstuhl. Transporting material into the middle of an ice-sheet is an expensive process that is done via aircrafts fitted with skis. The heavier the material the more fuel is needed for the transport. The wooden beams previously used are heavy and therefore require a lot fuel to transport. On the other hand, balloons are substantially lighter, can be reused for building new trenches and are not left behind as waste. An ingenious solution to a very unique problem! The EastGRIP project is a lead by Centre for Ice and Climate, University of Copenhagen, Denmark with several international partners and air support from the US Office of Polar Programs, National Science Foundation. You can follow the camp on twitter for photos and updates on daily life on the @egripcamp twitter account. A balloon ready to get inflated. Credit: S. Kipfstuhl.